Make sure to join us at 11 for our shocking exposé on chairs. Do they even exist? The answer may shock you. "The Death of God" is an idea that mostly stems from Friedrich Nietzsche, in particular the popular quote from The Gay Science, which is mostly reproduced in the comic. Nietzsche didn't mean that God had literally died, or even that we no longer believe in God, but rather that the culture as a whole no longer believed in God enough for him to be the absolute, solid grounding of our moral principles. In other words, whether or not we should base our morality on God's commands was now questionable for the first time. Michael Dummett was a 20th century analytic philosopher, best known for coining the term Anti-realism. Dummett is a complicated thinker that I don't have a great grasp on, but from what I understand he thought that it was untenable that the semantic statements that we made about the world could refer to any "things in themselves" unless there existed some sort of being who could independently apprehend those things "as they really are" (from Kant's thing-in-itself). He argued that this showed that God existed, and that without God we could postulate no such things. Berkeley was an 18th century idealist, claiming that only the ideas perceived in our minds exist. He said that the only way that object existed when no one was looking at them was because all things were always being perceived in the mind of God. Dostoevsky's part is based both on The Brothers Karamazov and Crime and Punishment. The The Brothers Karamazov many of the characters were terrified that atheism was taking grasp in the world, and if God didn't exist then "anything goes" (meaning that morality is baseless, and we can just do whatever we want). The actual scene is based on Crime on Punishment, where Raskolnikov murders an old woman with an axe. In the book he uses the blunt edge of the axe, so hopefully Dostoevsky fanboys will go easy on me for that. For Simone de Beauvoir, God had "abandoned" us, meaning that whether or not God exists, he has given no certain direction to us. We have to decide how to live either way, because we are totally free and seemingly alone. 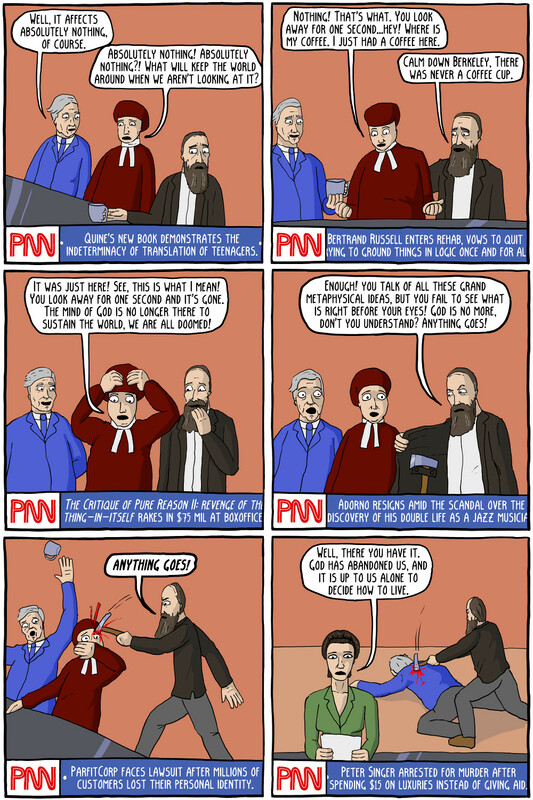 The ticker jokes refers to things such as: Aquinas's five proofs for God, Wittgenstein's Tractatus, Leibniz's Monadology, Quine's Indeterminacy of translation, Bertrand Russell always trying (and failing) to ground stuff in logic, The Critique of Pure Reason, Adorno hating Jazz, Parfit's critique of Personal Identity, and Peter Singer's utilitarianism.